In the real world I work for Royal Farms stocking the soda cooler among various other grunt jobs. I can’t complain if my job gives me paid vacation. My boss named Mary to protect her real life identity was nice enough to give me a week of paid vacation during the summer. Now that I have been at Royal Farms two years I have two weeks of paid vacation. 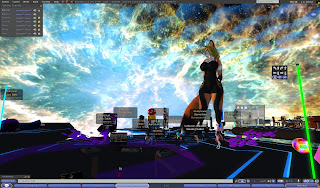 So today I wanted to write what I was doing in Second Life. I started in Shadowquine Maltz’s Ark which is one of Second Life oldest clubs for furries about 4:30am SLT which is 7:30am for me. http://maps.secondlife.com/secondlife/Quarabia/96/128/501 When I first discovered there was clubs for furries in Second life when I was a month old or so The ark (Like Noah and the ark saving animals from the great flood.) It happened to be the ark and at the time I was amazed of seeing a club of only furries when before I was hanging in human clubs not knowing about clubs like the ark. Keep in mind I was a newbie so I had no idea what second life was so I was still exploring around. The theme of the Ark is anything goes so don’t be surprised if you see adult goings on there. For example I was talking with a vixen in skimpy clothing just being friendly about tattoos and something in her profile on one of the dance poles. I happened to run into Stimpy Tripp an old bear of Second Life that I see around now and again. 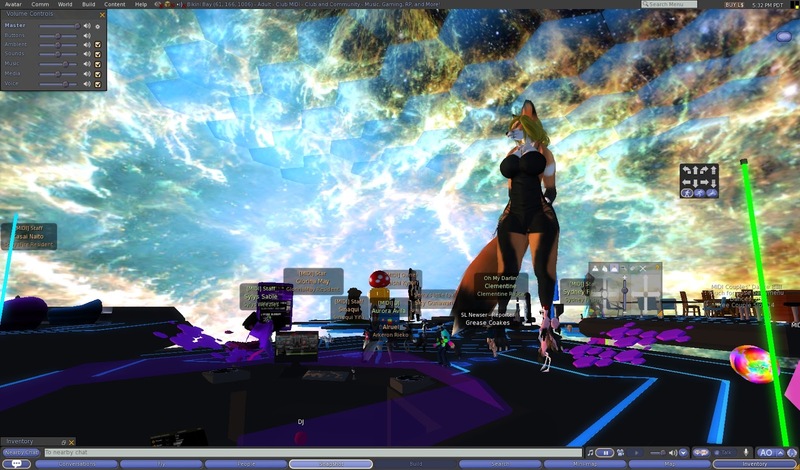 I remember seeing him at Second Life’s 12th birthday when I djed. He’s also one of Rita Mariner’s Sunweavers. Another friend I ran into was Zebrathingy Heyse AKA Zee. When Anthroxtacy or AX was alive and well we’d go see the same DJ Aurora Avila a few times a week. The DJ Raven Twang had a cool outfit at first I thought we was the dragoon character from Final Fantasy 8. But he corrected me and said, "If any influence for this character is attributed, it would be Mat Cauthon from Wheel of Time. The outfit I’m wearing is not so much the dragoon but based on Mat’s medieval fantasy attire." I myself have read the Wheel of time written by the late Robert Jordan and it’s beyond words describing how epic the fourteen book series is. Mat Cauthon is one of the main characters as one of three childhood friends who are destined to fight what they call the Dark One. Mat is a trickster and always has a smile to charm women. I won’t say more than that except to start the series read Eye Of The World. Shortly afterwards I went to a 500 word dash at Milk Wood (71/59/22), where’s it twice a day 6am SLT and 6pm SLT Monday through Friday. It’s a writing exercise to write 500 words in fifteen minutes based upon a word. Deva (Deva Westland), a faerie, teased me and said as I lag walked and ended up walking on a table, "You know, you can walk around the table, Grease.... hehe." Deva wrote a scene of a faerie mother having children making sure her small son didn’t wander into danger by entangling his ankle in a vine. Doyle, who writes stories of war, wrote a fantasy theme about a general asking for merchants for supplies despite the high risk. Raindrops (Gwen Enchanted): wrote about a famous man Tam Lin who is a ballad and here’s what she said, "Tam Lin is a very famous magical ballad. He's a man captured by the Queen of the Faeries, who's saved by an ingenue named either Fair Janet or Lady Margaret, depending on which version of the ballad you know." Arte or Artemis wrote a poem about snugging Doyle cookies and kittens and puppies. I wrote about one my characters doing something terrible, so she is forever banned from someone’s restaurant. Shannon hit Narcosis several times giving her a bloody nose and a black eye. Narcosis offered no resistance as Shannon cursed and yelled at her for endangering herself and her diner and friends. I took a break in real life to eat some cereal and apples and then I come back to Second Life, and seeing nothing of note in my notices I go to the IYC which is short for International Yiff Center at IYC Addictions (221/62/3001) . I also see Tantari Kim is online so I im her saying hi. She tells me she is applying to the Ark as a dj. She has a library of sets preplanned with different themes like MLP and "Still Alive" which centers around a single song https://www.youtube.com/watch?v=TERyxFfMqDk called Still Alive by Lisa Miskovsky. I showed Tantari Kim the famous blue vixen this song from electric mudkip. Tantari was nice enough to warp me to Citrus Cove (164/153/2487). an adult sim called Fox Haven Furry City East. Tantari commented it was a nice sim with nice people I mentioned it made me think of Metropolis, Superman’s home, or any other major city. Tantari and I chitchatted about this and that. A little later I took another break in real life, did some laundry and bought a beer and came back logging into the“I Love the 80’s club” at Gecko Isles (215/81/22). I hung out and chilled to Zack Coberts DJing. Everyone was joking that lag was ruining their day and that lag doesn’t exist in SL. I asked the pretty lady Lunavae Longfall to slow dance with me she said sure and I just relaxed and had a good time. There were a couple furries there, not just me. Furries aren’t just staying in furry clubs anymore they come to human clubs now and again watch out humans! I took another break for an hour and played Guild Wars 2, but before I find a LM from Xavier’s A List about some LM that showcases live music. I go to Lionheart Ahadi (121/214/3201). and hear a Zen Arado play ambient music that’s unique and very mellow. In the same sim Tip Corbett came after Zen Arado play live piano music. His live playing was amazing to listen to soothe my soul. 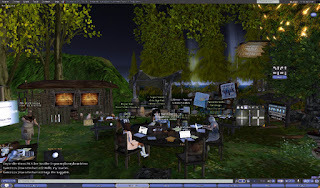 Later on 1:30pm SLT I see a notice about a spiritual discussion at New Paris (33/42/22). I warp over to a place called Nirvana Island.RobertDuke Drascol led the spiritual discussion over voice chat with a few other avatars. He was saying to forget ideas of the material world and ignore your ego and listen to your higher self instead. I had tried to leave to see my friend Skunk Mantra Fox Techno (Fox Fraxture) at his DJ set however Robert Duke asked me to stay and make comments about what he was talking about. I stayed until Robertduke said it was time to go. Then I visited Fox Fraxture at Furnication (189/199/27) and heard his mix of house and techno. I mentioned that he gave me one of his songs that you can hear in my soundcloud mix SL12B called Thouse Paws Up. It has lots of organ sounds and bass booms. 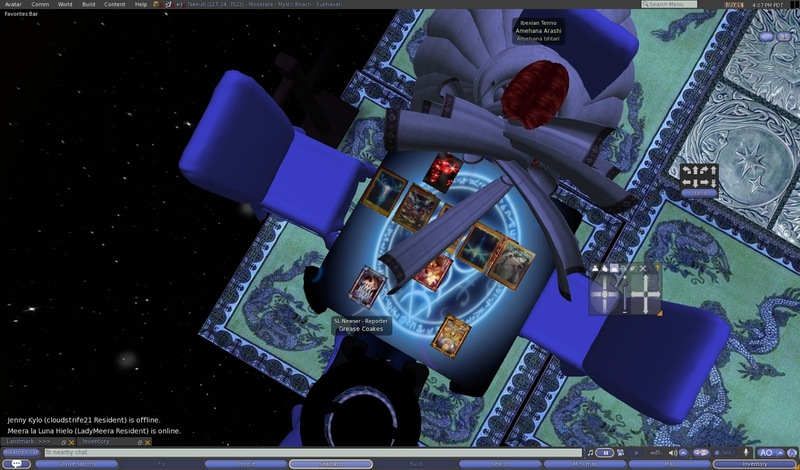 A few days ago Amehana Arashi (Amehana Ishtari) and I agreed to meet on Thursday at 4pm SLT for a tarot reading you might recognize the name as she read at Nisa sometimes (the ponydale sim.) She charges a fair price of 300L. I ponied up the cash and asked her where should I look for a publisher for my stories? Amehana suggested look at the local library and perhaps a librarian will help me and suggested to play fair with the editor. The forces at work here are more spiritual/karmic than material. Physical work is necessary as always, but a good deal of what will be of benefit will only be gained through relationships, the give and take. Last but not least of about eight months or so of working every thrusday night I go to see Aurora Avila at club midi at Bikini Bay (59/174/1006). One of the club owners,Sky Gunawan, has this to say about Aurora, "Heya everyone~ busy night again. Aurora, you're always bringing in a crowd." Aurora Avila answered, "I can't say I have any complaints about that! " I asked Aurora a silly question, "Hey if samus aran fought a dragon or two who do you think would win?" She answered, "Samus fights a dang dragon all the time. Ridley just keeps happening. (laughter), so she fights dragons anyway." As per usual everyone has a great time listening to Aurora’s songs based upon video games and dancing the night away. Aurora even called me a Tippyfox for sending tips her way to her "?" block with the mushroom on top. A little later Keesar Cushing one of the dj managers from Anthroxtacy came to say hi Aurora as well as Zee a long time fan of Aurora’s music. It was an excellent Thursday in Second Life and I did a lot. 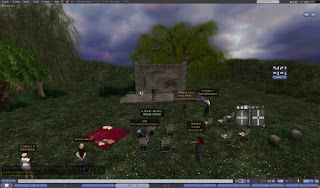 It was fun to share this day with you readers of the Second Life Newser. You were very busy indeed. A small correction, the pony groups I am admin for are the Nisean grouping, though I also help with the Trotsdale sim as librarian curator. Ponydale is a separate sim and group from the pony groups I help with. I was woken up remembering some resources with Writer's Digest regarding publishers looking for submissions. Looking for that right now. Did you know you can get these AUTOMATICALLY AND ABSOLUTELY FOR FREE by getting an account on Like 4 Like?